So again, it has been a while since I've posted anything. I'm not sure if its because I'm lazy or that I just think you don't find this blog very interesting. But if I am wrong and you do read what I write, then lets continue. As you know I <3 80's TV sitcoms. Since a lot of bloggers tell you what they are reading and watching I thought I'd give an update on some stuff I've been into. On a recent trip to Best Buy I picked up season 1 of My Two Dads, what a great show. I've already watched the first 3 episodes and I just can't get enough. I truly forgot how much I enjoyed this show. Paul Reiser is good, the guy that played Joey is great. The judge makes me laugh. But Staci Keenan's Nicole Bradford is what makes the show. As she should since the story revolves around her. 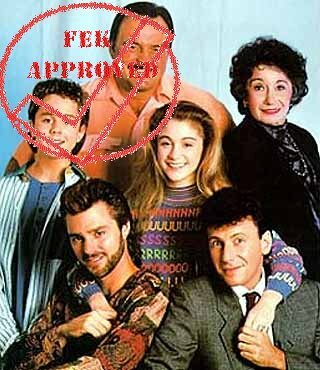 I also just completed Family Ties season 4. I have season 5 already, just haven't had a chance to watch any of the episodes. All I can say is the Mallory gets better and better every season. I also picked up Mr. Belvedere seasons 1 & 2 the other day. Again, I haven't had time to watch any of the episodes but I'm looking forward to it. Are there any shows that you can think of that I should be watching from the 80's? Let me know, leave a comment. And if you haven't watched any of the shows I mentioned you should give them a look if you like 80's as much as I did.